Money Marketing readers are split perfectly evenly on whether they think markets will take a downturn this year. 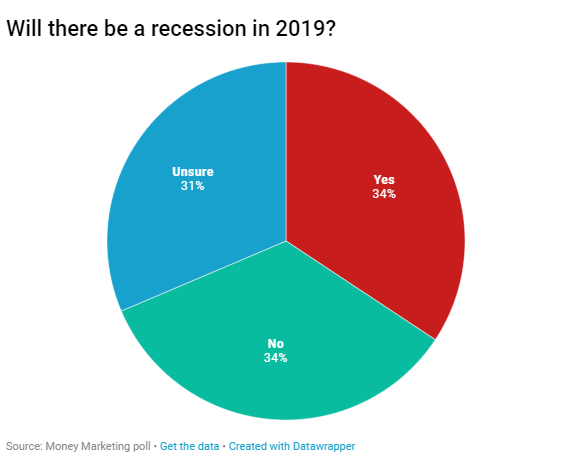 In just a day since it opened, more than 170 of you have responded to our poll on the possibility of a recession in 2019. 35 per cent predicted that there would be a recession. The same proportion, 35 per cent, believed there would not be one, with the remaining 30 per cent unsure over which way markets will go. The FTSE 100 was down 0.27 per cent this morning, with analysts pointing to an earnings warning from Apple as putting a dent in investor sentiment. Managing Partners Group chief executive Jeremy Leach says: “Key drivers of an equities bear market will be Brexit uncertainty, further tightening of monetary policy on both sides of the Atlantic, political gridlock and trade tensions – all forcing equity values lower in the UK, Europe and the USA. “While many analysts think the S&P 500 will end 2019 higher than its current level, this is optimistic given that recession is widely predicted for 2020 and a bear market for US equities is more likely in 2019. However, others remain positive that the global economy will be able to avoid a downturn this year, despite headwinds. Seneca Investment Managers chief investment officer Peter Elston says: “The unnecessary US tax cuts have certainly boosted the economy, but at the expense of future growth. Trade frictions could turn into a full-blown trade war that would precipitate a downturn. “China’s economy has started to falter and may experience a hard landing that would reverberate around the world. Moreover, the fault lines that caused the great financial crisis in 2008 may become active again.